Each drum is played with a single key (the hi-hat with two keys). To change the key, press the "Set key" button at the bottom right of each instrument, then press the key on your MIDI keyboard. The drum will now play on that key. When you load a multi instrument, Kontakt will ask if you want to "Replace Multi (pressing "No" will merge in the new instruments)?". If you press "No", your current output configuration will not be replaced. (Also any instruments you have previously loaded will be kept). The bad thing is that each instrument might be assigned to a unique MIDI channel, and you have to set all instruments to respond to the same MIDI channel manually (change the "Midi Ch", below the instrument name). If you have Kontakt 4.2 or later, the output section has a "Presets / Batch Configuration" menu. In the "Batch functions" submenu in this menu, the "Clear output section and create one individual channel for each loaded instrument" does what it says and can be quite useful. 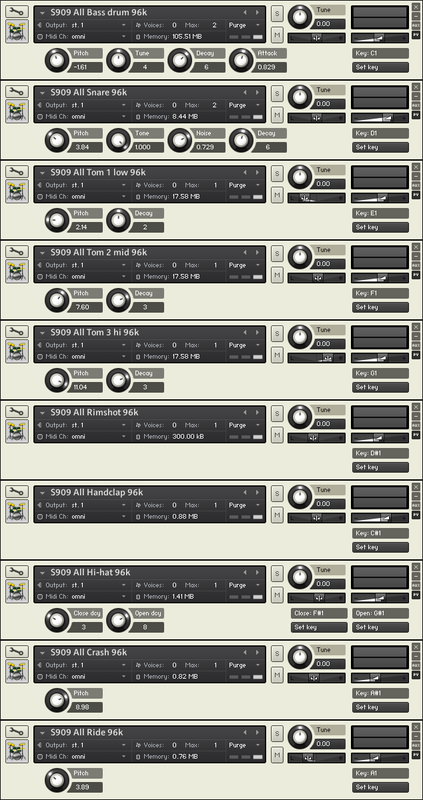 These are the individual instrument programs from the "S909 All" multi instrument. You can use them to create your own drum kits with fewer drums or multiple variations of the same drum. After you load them, you might have to change the "Midi Ch" so that they all respond to the same MIDI channel.